There are many art museums across the United States with notable collections. Yet only a portion of these museums specialize in American Art. It is true that many museums collect American art, but few focus solely on it. 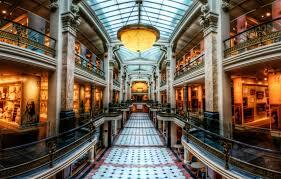 A student tour of Washington D.C. is greatly enriched with a visit to the Smithsonian American Art Museum. A visit to this comprehensive museum will expose students to American Art and artists. Class preparation for a trip like this is important. Many teachers will want to incorporate blended learning exercises to pique student interest in the class trip to D.C. Prior to a visit, teachers will want to explore the rich, in-depth classroom activities available online. Visit http://americanart.si.edu/education/activities/online/index.cfm to review them all. Teachers will love the prepared exercises. Students will learn about American art from different perspectives. There are classroom exercises that focus on different eras in American Art, evolving identities for various ethnic groups, and fun, mystery solving exercises that help students retain what they learn. An example of an inspiring and interesting exercise is Meet me at Midnight. This imaginary adventure involves a folk art sculpture coming to life at night and mixing up the art in the museum. Students are tasked with setting things aright. There are a plethora of ways to learn about art. One of the ways to do this is to immerse students in the stories of artists. Many of the artists featured in American Kaleidoscope emerge from working class backgrounds or specific ethnic groups and achieve greater recognition for their works through social movements, such as Chicano Rights, Black Rights or even Women’s Rights. Selecting Del Corazón! is a way to immerse students in the experience of the Latino artist. This classroom exercise features bi-lingual interviews of artists. Plus, the interactive zoomify feature allows students to take a closer look at work by this important group of Americans. In Cleopatra: Lost and Found, students will learn more about the intersection of art and history. The focus in this exercise is gaining a unique understanding of historical, literary and biblical figures celebrated in the art of sculpture. For many art students, participating in classroom activities online will be stimulating and fun –but these exercises still do not compare to a real time visit to the Smithsonian American Art Museum and Downtown Washington D.C. Teachers will want to combine the online learning with a real visit to see the exhibitions. The Smithsonian American Art Museum was renovated from 2000-2005. The Renwick Gallery is a centerpiece of the work completed and it is a stunning example of architecture. This was actually the first building in the U.S. specifically built to be an art museum. An important part of the gallery that is not to be missed is the Renwick Gallery. Located right across the street from the White House – this building houses American craft arts. The current exhibition is called Wonder. This exhibition of large-scale installations includes well-known cotemporary American artists. Smithsonian American Art Museum continues to be a leader in art education across the United States. Since 2006, the Museum curatorial staff has launched 14 major traveling exhibitions of more than 1,000 pieces of art from its permanent collection. The Museum’s renovations left more time for curatorial staff to take a deeper look at the collection and send parts of it on tour. 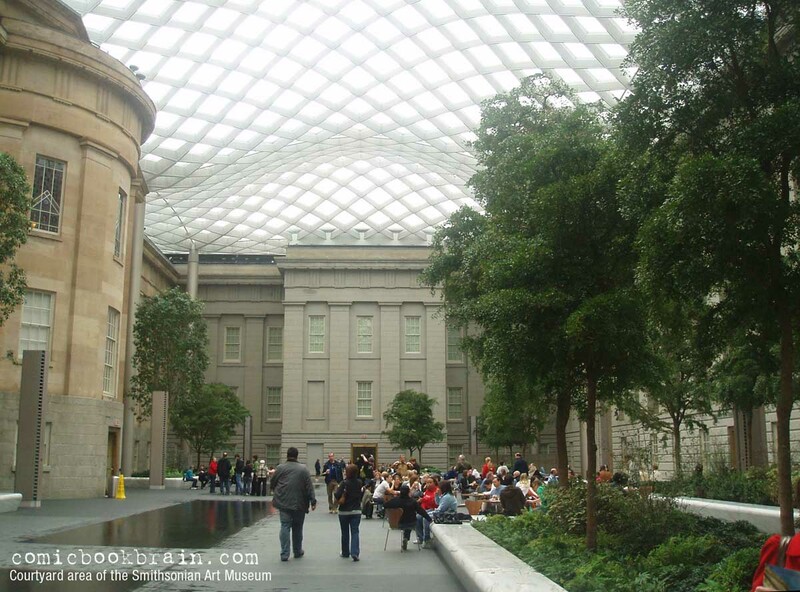 There are plenty of reasons to take student groups on a trip to Washington D.C. For more information on a Student Art Tour of Washington D.C. or a general student tour of Washington D.C. that incorporates a visit to the Smithsonian American Art Museum, Request a Quote. class trips d.c.educational travel d.c.student tours d.c.student travel d.c.student trips d.c. The Tenement Museum is a great place to visit to understand 19th Century immigrant lifesytles. 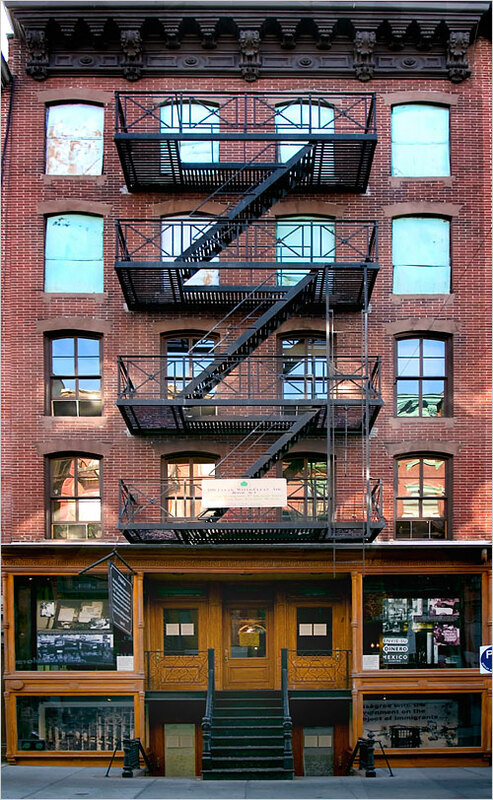 Located near Chinatown in Lower Manhattan at 103 Orchard Street, the Tenement Museum is one of the most important museums chronicling the extensive history of American immigration in the past two centuries. There are restored apartments with detailed histories of the people who left their homes and families to live and work in this new and hopeful and often unpleasant new country. There are also many walking tours and themed exhibitions, making this the most in-depth museum of its kind. A Time Capsule in Lower Manhattan? While many Americans reluctantly recognize a new wave of anti-immigrant fervor, it is the perfect time to educate students about the historical trials of the millions who made their way to the United States for a better life. One of the best places for a closer examination of this history is New York’s Tenement Museum, founded by historian and social activist Ruth Abram. It was almost an accident that Abram and her cofounder Anita Jacobsen found their perfect location for the museum when inspecting the storefront property on Orchard Street. Cracking a door to a backroom was all it took for them to discover that the entire building was former tenement housing sealed from the public for more than half a century, the perfect time capsule. Since then the site has become a national trust for historic preservation. Extensive and meticulous research has revealed details about the many mid-19th Century immigrant lives at the Orchard Street address. Over the past twenty years museum staff have restored half a dozen apartments, most recently the home of Irish immigrants, The Moores, who lived in the building in 1869. Students and teachers alike will learn while enjoying the restored tenement building for a complete time travel experience. Educators can attend workshops at the museum that are specifically designed for them on building classroom curriculum about the historic aspects of early immigrants. The workshops include details on basic survival skills of the early immigrants. This included learning to buy and sell goods in the neighborhood. Outdoor markets, corner stores, bakeries, meats and dry goods stores shaped the overarching definition of what it means to live in an American city in an immigrant neighborhood. A key component to the workshops looks at industry and how immigrants were used as cheap labor for factories. The kinds of work and the on-the-job dangers experienced are an important part of this discussion. Ultimately, immigrant communities would create unionization of workers to combat abusive practices of factory owners. The struggles of the new Americans helped shape the idea of fighting for control over the well-being and rights of every working person. These early immigrant workers made marks upon our nation that continue to be a point of contention for industry, workers and leading politicians. Many different experts have come together to uncover the history of the Orchard Street apartments. Wallpaper conservators, paint specialists and urban archeologists have combed the building to piece together stories that have implications in understanding family life and legislation of landlords. The building tours have various themes. The “Shop Life” tour examines the many family owned businesses that grew out of different immigrant communities from butchers to undergarment discount stores. The “Sweatshop Workers” tour takes a look at the garment industry and the “Irish Outsiders” tour focuses on the Moores, a family faced with prejudice as they prepare for the historic St. Patrick’s Day Parade. Walking tours also have various themes, like “Tasting the Tenement,” a tour of the food in the surrounding neighborhood, from bagel shops to falafel cafes which remain an important part of the history of immigrants. There is also the “Tenements Talks” which are an ongoing series of discussions by writers and artists about their lives connecting to earlier immigrants. Upcoming talks by Laurie Anderson and others can be found on the museum website in the events listings. The museum offers activities on learning with objects and primary sources as well as lessons in oral history. There are also English as a Second Language (ESL) programs available. 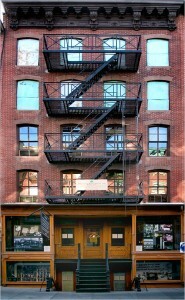 The Tenement Museum is situated in the heart of Lower Manhattan. It is a very quick walk to Chinatown, and New York City offers one of the busiest and most delicious Chinatown experiences in the nation. The Tenement Museum is a complete experience for students and teachers alike, and the surrounding neighborhood helps enrich the time spent there. For more information on scheduling a student trip to New York City with the Tenement Museum on the itinerary, Request a Quote. The 2016-2017 Broadway season is promising and filled with some popular choices in musicals for student travel groups. The Lion King and Wicked continue to make long-term runs on Broadway. These Broadway Shows are an excellent choice for student travel groups – because they accommodate groups in larger numbers. Each musical is presented in high Broadway style with video and audio sound effects and exceptional costuming, music and dance. A student trip to NYC is not complete without a trip to Broadway to take in a show. For some students, perhaps the musical Frozen, due out in 2018, will be their first choice for a Broadway show in the near future. For now, audiences will have to wait for the production to come together. The newest, hottest ticket on Broadway is Hamilton. This Broadway show won the 2016 Grammy Award for Best Musical Broadway Theater Album. As Hamilton’s popularity surges, so will ticket sales in the future. Be sure to arrange tickets far in advance with the help of a student travel company. Alexander Hamilton was an immigrant and now he is an important part of Early American Revolutionary War studies. For history and social studies teachers, Hamilton promises to be a great boon to classroom studies and fun to attend as well. Taken from the 2004 biography by the same name as the musical, the book by Ron Chernow is a close look at Alexander Hamilton’s life. The musical traces this immigrant’s rise to fame as the youngest signer of The Declaration of Independence. Hamilton’s writings and ambition are what brought him to the inner circle of founding fathers. At the age of 22 Hamilton was the Aide de Camp of General George Washington, and by 34, he was the country’s first Secretary of the Treasury. The composer, Lin-Manuel Miranda, has taken an unusual approach to this Off-Broadway musical, now the hottest ticket on Broadway. Lin-Manuel Miranda also plays Hamilton and has based his life on the biography of Hamilton, but has given him the songs and dreams of a hip-hop star. Because Hamilton came from the Caribbean and was abandoned by his father, he had much insecurity about his birthright and his lower station in life. Hamilton is portrayed as a man who tended to overcompensate in dress and speech yet was eloquent enough to be successful. One thing is for certain, the comparison to hip hop culture and speech will not be lost on high school students visiting Broadway for the first time. Hamilton’s costume is designed for the era in which he lived, with a flamboyant nod to Early American attire and styles. The musical is composed of songs that are a bold mixture of hip-hop, R & B and even 1970s pop. It’s a great example of a montage of American styles mixed into musical composition. Hamilton is truly a Broadway show student travel groups can get excited about. Hamilton’s untimely death in a duel with his lifelong nemesis, Aaron Burr, came about in 1804. Perhaps this is another comparison to hip-hop culture – dying young yet courageously of a fatal gunshot wound from an enemy. There are other great musicals for student travel groups to select from on Broadway, such as Beautiful, the Carole King Musical about the 1970s singer/songwriter star. Or groups may want to check out Holiday Inn, an Irving Berlin musical production that closes in the fall of 2016. Student travel groups are sure to be amazed and dazzled by any of these professional theater productions. Whatever the choice for Broadway musical, teachers and trip leaders will need assistance from a qualified student travel company in reserving and purchasing the correct number of seats for the desired production. To learn more about scheduling a student trip to New York City and Broadway, Request a Quote or email info@educationaltravelconsultants.com. For those interested in studying the Civil War, a visit to Harpers Ferry will easily explain its critical geographical position. The natural boundary between north and south is the Potomac River. The Potomac River joins the Shenandoah River here, at the headwaters of the Shenandoah River Valley. During the Civil War, rail and ship transportation were key to supply chains for both armies. Harpers Ferry had both forms of transportation and was a strategic location between north and south. The Confederates were wooing Maryland residents to take up the Confederate side during the war and Harpers Ferry was a good position for this sort of public relations campaign. The U.S. Armory and Arsenal was opened at Harpers Ferry in 1797. This facility produced over 600,000 muskets, rifles and pistols from 1707-1861. Harpers Ferry was also the first place in the U.S. to mechanize the production of weapons. John Brown was an abolitionist with radical ideas about freeing slaves. He set out on the evening of October 16, 1859 to raid the U.S. Armory and Arsenal with the objective of seizing 100,000 weapons. These he planned to distribute to slaves to fight a guerilla war against slavery in the Shenandoah Valley. About a day and a half later, with Brown’s men killed or wounded, he was captured by the U.S. Marines. For his crimes of sedition against the country, he was hanged on December 2, 1859. John Brown’s Fort stands today as a memory of the raid, and the place where he was captured. It would take less than two years from the time of John Brown’s raid, and the country would be in a state of civil warfare. Confederate and Union soldiers passed through Harpers Ferry, making it a vulnerable location. Less than one day from the time Virginia seceded, Federal soldiers burned the armory n April 18, 1861. Yet only 15,000 weapons were burned, and Confederates were able to take the weapon making machinery into the South. The Confederates held Harpers Ferry until the Battle of Antietam concluded in 1862 then the Union reoccupied it . All together the town changed hands eight times between 1861 & 1865 – which illustrates its significance. To make it fun for students to prepare for a trip to Washington D.C. and Harpers Ferry, the National Park Service has a game (designed in Powerpoint) called Harpers Ferry Jeopardy. Another useful classroom teaching tool, The War for Freedom is designed for the student to gain a better understanding of slavery and emancipation. The War for Freedom includes intro text, teacher pages, learning activities and additional resources. Students can learn about slavery from the viewpoint of a slave and trace his or her journey to emancipation. Also documented in this section are actual stories of African American soldiers who fought hard for their freedom on different battlefields of the Civil War. The National Park Service has designed a lesson geared towards 5th-8th graders that focuses specifically on Harpers Ferry. The Battle for Harpers Ferry, 1862: Harpers Ferry is the Key! includes four lesson plans that take 30-40 minutes to cover in the classroom. Students gain a better understanding of the strategic importance of Harpers Ferry for the Union and learn more about the life of a Civil War soldier. With so many great classroom tools to work with, teachers will find it easier to help students understand the importance of Harpers Ferry during the Civil War era. They will also be able to tie this lesson into another about the Battle for Antietam. A real visit to Harpers Ferry will enable students to understand the geographic position of Harpers Ferry today and to view some of the historic sites where armies were situated. Harpers Ferry has sites and trails in three different states: West Virginia, Virginia and Maryland. To plan a student tour of Harpers Ferry with a student travel company, Request a Quote or email info@educationaltravelconsultants.com. Student groups studying the Civil War Battle of Antietam will find a visit to this historic place to be a beneficial learning experience. Named after a creek in Maryland near Sharpsburg, Antietam Creek once ran through farmland and forests. It was in this remote section of Maryland that General Robert E. Lee made his first incursion into the North and took a firm stand against the Union Army. The fated day of the battle of Antietam was on September 17, 1862. This first battle in Maryland was traumatic, with 100,000 soldiers clashing. 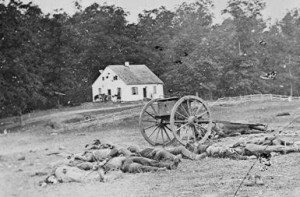 Over 23,000 soldiers were lost during the 12-hour battle of Antietam with casualties the heaviest on the Confederate side, around 15,000 soldiers. Although most people believe Gettysburg was the bloodiest battle of the Civil War, in fact it was the Battle of Antietam. Antietam was part of Confederate General Robert E. Lee’s overall strategy of advancing his Army of Northern Virginia into the North. This would bring the Civil War to the Union territories. He hoped to inspire some to rethink their position on the Civil War altogether. In Maryland, the populace was divided as to allegiance to North or South. Lee sought to convince the slaveholders and propertied landowners of Maryland to join the Confederate cause. Not far away, Washington D.C., the Union Capital city, needed to be defended. Lee’s first attempt to bring the battleground North was also seen as a mighty force being brought upon the nation’s capital. His invasion was answered with the full force of the Union Army. General Robert E. Lee gathered his army on the western banks of Antietam Creek. Meanwhile, Stonewall Jackson’s troops held the left flank and General James Longstreet’s army held the center position for the Confederates. Human losses at Antietam were devastatingly large because the battle lasted over 12 hours. There were huge casualties on both sides. On September 18th, both armies carried the wounded away and buried their dead. Lee and the Confederate Army took leave of Sharpsburg and Maryland altogether. They crossed the Potomac River back into Virginia, much to the relief of the Union soldiers and citizens of the North. This first decisive battle would leave its mark on Confederate and Union troops. It surely was a bold move by a General whose strategy was unique and took chances. The Battle of Antietam was the bloodiest battle of the Civil War. For the small town of Sharpsburg, Maryland this battle of the Civil War was a devastating blow. Properties were destroyed and crops were burned. Much was lost, including livestock and other food sources. Now the people of the North knew what it was like to live amongst battle torn countryside and ruins. Prior to a planned class trip to Antietam National Battlefield, students will want to study this year in the Civil War that included other decisive battles. One such battle was for Harpers Ferry, which took place in tandem with Antietam. While Lee positioned troops on the northern front, Stonewall Jackson’s army took Harpers Ferry, a town that possessed a strategic railway station and a large munitions cache. Another focus area of study may include an investigation into Lee’s strategy to bring the Confederate Army – and Civil War – North. By visiting Antietam, students can participate in the Parks as Classroom program and learn more about the background of the land, its people and the soldiers who fought there. At the Antietam National Battlefield Visitor Center students can review historical photographs, sketches and paintings of the battlefields during Revolutionary times and tour the battlefields today to learn more about pivotal skirmishes during the battle. When considering a class trip Antietam, teachers and trip leaders may want to schedule a trip to Washington D.C. and Northern Virginia to to visit other key Revolutionary War Sites. Request a Quote or email info@educationaltravelconsultants.com. Charleston, South Carolina has a rich history, beginning in the Revolutionary War era and pre-dating it. The Ashley and Cooper Rivers converge to create an inland harbor, making it one of the most prosperous and perfectly formed and located port cities in Early America. Seen as a ‘crown jewel’ city by the British Navy, Charleston was attacked twice in the Revolutionary War: once in 1776, when it was defended by General Moultrie successfully, and again in 1780, when the main peninsula and harbor were commandeered by the British and no ships besides theirs were allowed into port. Students of history and social studies and even military history can learn much through the active study of Charleston. Since its inception in 1670, Charleston has always been a strategic coastal settlement and bustling port city – and remains so to this day. While the army of Patriots in the North fought off the British and dealt with traitors (Tories) and espionage, the South was also faced with inconstancy in allegiances. In Georgia, prosperous landowners and businessman aligned with the British, so the state was easily taken over by the British. Some of these sentiments spread to the landowning class in South Carolina. In South Carolina the entire population was not so easily converted to ‘Tories,’ especially in the upstate, the rural areas and the backcountry, where resistance to British rule was strong. So the Revolutionary War resembled a civil war in the South because these open alliances with the British divided families, neighborhoods and towns. The first shots of the American Revolution may have been heard in Massachusetts – but they also resounded in the south in Charleston’s harbor on June 28, 1776. With some foresight, Americans built fortifications at Sullivan’s Island, which sits at the mouth of the harbor. An assault force of nearly 3,000 British soldiers and seaman were repelled by Patriot General Charles Lee in 1776, protecting the city from harm. By engaging the British forces here, the Patriots were able to save Charleston from falling. This important first battle for Charleston encouraged many to join the Patriots and fight for a new united country. Recalling the battle of 1780, when the British once again attempted to lay siege to Charleston, is a far darker episode in the Revolutionary War. Overwhelmed by the nearly 10,000 British troops in the harbor – the Patriots fought valiantly. The second time the British Naval forces entered the Charleston harbor, they passed Sullivan’s Island and laid siege upon the City. The British successfully captured the Peninsula and the entire city of Charleston fell into British hands on May 12, 1780. Over 5,000 Patriot soldiers were imprisoned and British troops occupied Charleston until the Revolutionary War concluded. Over a year later, the surrender of General Cornwallis at Yorktown, Virginia on October 19, 1781 would free Charleston’s occupants from British rule and captivity. Knowing the history of Charleston’s struggle with Patriotism, it’s no wonder the movie, The Patriot, was filmed in Charleston and in some of its historic homes and estates. Some sites student groups will want to tour include Fort Moultrie, Fort Sumter, the Heyward-Washington House and Middleton Place House Museum. All of these sites date to the Revolutionary War era. Trip leaders may want to take shorter trips west, into South Carolina, where the Revolutionary War continued. In Camden, South Carolina British troops were met with strong resistance that spread into other battles across Clarendon County. A tour bus can easily take student groups out to selected battlefield destinations. Work with a student travel company to determine which sites work best for Revolutionary War studies and are accessible at the time of year Charleston is visited. Learn more about a student tour based on Revolutionary War sites in South Carolina. Request a Quote for more information. September through May is an excellent time to take student travel groups on an eco tour of the Saint John’s River. Student travelers will be fascinated by the famous manatee, the gigantic sea creature with a Buddha-like personality. At the intersection of Blue Spring State Park and Saint John’s River, students are likely to see this joyous creature that visits the back-waterways of Florida seasonally, where there are warm waters and plenty to eat. The world of reptiles, wading birds and more awaits the eager student of the environment who will learn more about Central Florida through active immersion in the natural world. Have students engage in online studies about wading birds such as the blue heron, wood duck or water thrushes. In reptile species, students can investigate alligators, turtles, frogs, lizards or snakes – all plentiful in the Central Florida region. Or, perhaps they are interested in studies about bottlenose dolphins and river otters or even muskrats- all native to this eco-system. Why Are People So Fascinated with the Manatee? Also known as the ‘sea cow’ the manatee has a bizarre yet fascinating appearance. Its overly large body is buoyant while its head is small in comparison. A set of docile eyes gives the manatee the natural look of compassion and empathy not seen in many species. 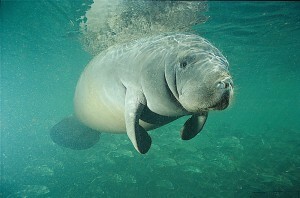 The manatee lives in the Saint John’s River from November-March. During this time no swimming or boating activity may occur at manatee protected areas – including Blue Spring State Park. Student travel groups may still observe them in their winter habitat. This part of Saint John’s River provides the warmth and food the manatee need and all who visit love to gaze on the many manatee that gather in the River. The upper Saint John’s River provides diverse swampy habitats and boating activities are not restricted during manatee season. Upriver, there are an assortment of riverboat tours to choose from. Schedule a boat tour in advance in conjunction with a student travel company. Touring the river like this will give students a chance for close observation of many species of mammals, reptiles or birds they have studied beforehand. A science or environment teacher’s presence enhances the experience. On board, students will listen as a tour guide points out and describes different habitats and parts of the river, while students look closely for the animals that live in Central Florida’s inland rivers. The Saint Johns River is unusual because it flows south to north, is relatively young (5,000 years old), and runs a length of 310 miles. Yet, it flows very slowly, making it the perfect environment for a student group study of an eco system. The Saint Johns River basin is inhabited by 3.5 million people and spans 8,840 square miles. The northern end is in a warm temperate climate while the southern end of Saint John’s River is in a subtropical climate. This student tour focuses on the area close to Orlando, or Central Florida. A canal links the Saint John’s River to the Hontoon Dead River. A dead river is very much alive. What distinguishes it from other rivers is there is little current. Snake Creek is another tributary that surrounds Hontoon Island State Park. This is another warm water refuge for manatees and is protected by the State of Florida. Manatees are reportedly friendly to paddlers on the Hontoon Dead River. The marshy landscape beyond the island is lined by Cypress Swamps and hardwood hammocks. Here, waterfowl, reptiles and various swamp vegetation can be studied by student groups. The slow movement of the river is an advantage. With a span of 310 miles there is so much to see on the Saint Johns River. Each of the tributaries has something different to offer, too. The most exciting thing for students will most likely be sighting manatees or even getting close. However, boat tours can only get so close to see them in season without disrupting their protected natural environments. The boat tour has a great deal to offer student groups by passing through different environments on the river, illustrating diversity of habitat and species. Many students will want to post photos to their individual Facebook accounts. Why not make a community Facebook page just for the adventure? If set-up of a special page is too complicated, consider asking the educational tour company to use their Facebook page to share these outdoor adventures. What is important is sharing in one place on the Web, to gain differing perspectives. Pictures and captions of the class trip to Central Florida are sure to be colorful. Sharing is a great way to engender learning. Have students collect information about the mammals, reptiles, or waterfowl they choose to study. Share the experience of seeing actual manatee in one whole class session – using photos, film and writings captured along the way. Choose a seasoned student travel company to help make a visit to Saint John’s River spectacular and fun. Email: info@educationaltravelconsultants.com or visit http://www.educationaltravelconsultants.com. For many ambitious music and performance students, a class trip to New York City is the holy grail of rhythm. From jazz to classical to pop to Broadway Musicals, a student trip to New York City continues to be a premiere destination for student travel groups. There are literally hundreds of musical landmarks and hotspots in the city to choose from, so deciding where to start can often be a music teacher’s biggest challenge. However, Lincoln Center and Carnegie Hall, in particular, can offer students the kind of up-close and personal “blended learning” experience they aren’t likely to forget. After all, studying contemporary music—and musical history—is one thing, but actually traveling to legendary musical destinations is a complementary learning experience that has the potential to excite and engage students even more than classroom studies. For many aspiring musicians and performers, a gig at either Lincoln Center or Carnegie Hall is perceived as the apex of one’s career. Following are some facts that students can learn online about these two major venues in New York City. Constructed in the 1950s and 1960s as part of a massive community renewal project, Lincoln Center houses some of the nation’s most famous musical landmarks, including the Metropolitan Opera House—home of the Metropolitan Opera—and the internationally renowned Julliard School. The school offers campus tours so make sure to have an educational travel company arrange one for a student group prior to visiting. 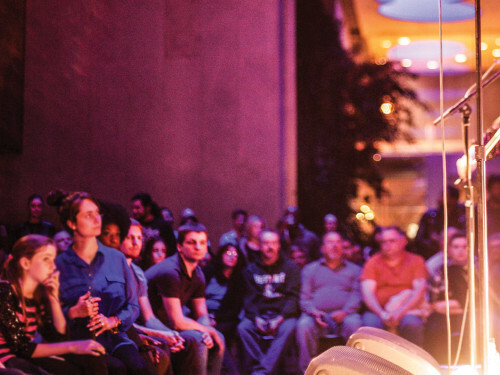 Lincoln Center is also known for a popular Meet the Artist School Series, a guided student tour that guarantees students VIP access to Lincoln Center landmarks and special performances not open to the public. A student travel company can pre-arrange all of this well in advance, ensuring music students touring New York City have an eye opening experience when they tour this legendary venue. To fully understand the immensity and significance of Lincoln Center as well as the work that artists perform behind the scenes, students can prepare for their journey by viewing YouTube performances of Lincoln Center concerts and/or taking virtual tours of Lincoln Center on the Web. These types of preliminary activities are sure to provide a valuable historical context and amp up pre-tour excitement for the student group. 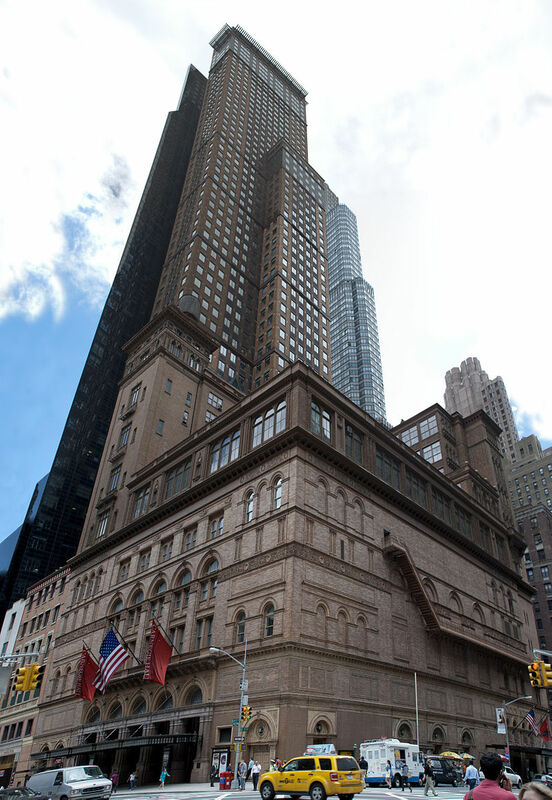 For almost 130 years now, Carnegie Hall has been one of the world’s most beloved classical and popular music venues. Indeed, well known musicians from George Gershwin to Louis Armstrong to Judy Garland to Led Zeppelin and the Beatles have played here. Whether a student wants to be a classical violinist or a rock-n-roll star, Carnegie Hall is a pilgrimage worth making. The Hall is also known for its extensive on-site educational resources: its Resnick Education Wing is impressive. It has 24 brand new spaces that are designed for students and music educators. 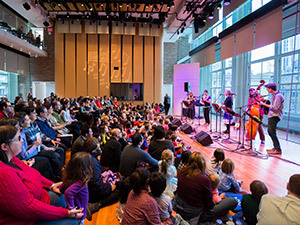 The Weill Music Institute offers the kind of interactive, hands-on learning experiences that are bound to inspire music students —and galvanize them into dreams of a great future. Even after a student tour of New York City is over, the learning experience may still continue. Students can join Carnegie Hall’s Musical Exchange Program, an online community where students and young musicians can share performances, participate in virtual workshops, and network with each other. The Exchange program can be a great supplementary classroom learning experience that is ongoing. It also serves the dual purpose of opening possible doors for students who are serious about a musical career – which makes it a wonderful and potentially invaluable resource. In the same spirit, teachers can encourage students to share their observations post trip with each other in school-facilitated chat rooms. Students can also film and photograph their group’s tour, and have them collaborate in making a mini-documentary about their New York City experience. Some music educators may want students to try their hands at their own musical compositions, which they can then share on the Carnegie Hall Music Exchange or on their YouTube page. All of these experiences will stimulate creative minds to collaborate and share. In short, when it comes to blended learning—especially in music, which is interactive by nature—the sky is the limit. At Carnegie Hall and Lincoln Center, students can really get a sense of just how exciting a career in music can actually be. To learn more about scheduling a class trip to New York City that includes an inside look at Carnegie Hall and Lincoln Center, email info@educationaltravelconsultants.com or visit: http://www.educationaltravelconsultants.com. The Battle of Antietam was fought in Maryland during the Civil War. For students who are studying to become soldiers and officers in the U.S. Armed Forces, reflecting on some of the largest (and bloodiest) land battles fought in our history can be insightful. Contemporary armies have far more technology on their side with faster transportation and communication, while their predecessors had much less. Despite obvious differences in eras studying the preparation and enfolding of significant Revolutionary and Civil War battles – and visiting these sites, can prove to be quite a lesson in strategy and execution in the theater of war. Combat is a last resort for any country. Once initiated war has casualties. Troops and their families have to bear the brunt of war, with the threat of death, dismemberment and injury. With limited medical knowledge about infection and its cure, troops in the Revolutionary and Civil War had to suffer illnesses and infections that would be curable today. In addition, movement of deceased and injured bodies was a hardship, so the historical battlefields are often grave sites for those who have fallen. This is all the more reason why ROTC students should visit these battlefield sites in person. Students will stay at a hotel in Northern Virginia so Washington D.C. is easily accessible. Bus service will be provided to each destination with maximum time estimates to be two to two and one half hours to reach the furthest battlefields. Virginia is the site of many famous battlefields. Yorktown National Battlefield is the place where General George Cornwalis surrendered to General George Washington and French forces in the fall of 1781. This famous battlefield marked the end of the Revolutionary War. The victorious union of 13 states celebrated the culmination of a struggle to free themselves from British rule. Yorktown Battlefield is not only the jewel of all battlefields – it is vast. The tour is 16 miles and can be seen on a trolley. Earthworks have been preserved and areas where skirmishes were fought are marked and described. Learn how artillery and strategy as well as the placement of Yorktown on the York River helped to win the victory in the Revolutionary War. Called the bloodiest battle of the Civil War, the battle of Antietam was fought on September 17, 1862 . Over 23,000 soldiers who were killed, wounded or missing. In this battle, General Robert E. Lee shows his prowess by attacking the North in Western Maryland, in a 12-hour siege that devastated the city of Sharpsburg, Maryland. Because this battlefield is so close to Washington D.C., Lee was threatening the seat of power in the North. But Lee had other plans. He instructed Stonewall Jackson to secure Harper’s Ferry, the armory and supply line for Confederate soldiers in Virginia and further south. After securing Harper’s Ferry, Stonewall Jackson returned to Antietam to defend the battle line. The Confederate forces held their ground but buried their dead and retreated across the Potomac River, back to Virginia. President Lincoln responded by issuing a preliminary Emancipation Proclamation, the first step towards making slavery obsolete. There were two battles in Manassas, Virginia and both strengthened the positions of the Confederate army. Taking the battle to Virginia was seen as a way for the Union to end the war quickly. General Irvin McDowell set out to Richmond, the South’s capital, with 35,000 soldiers. He was stopped by approximately 22,000 Confederate soldiers, waiting for the advance. With the assistance of 10,000 troops stationed in Shenandoah Valley, the First Battle of Manassas began. Also called the Battle of Bull Run, so named for the river, this decisive battle is an example of military strategy and communication converging to bring about victory on the Confederate side. The second Battle of Manassas was another example of General Robert E. Lee’s exceptional battle strategies. After chasing the Union army away from Richmond and North, across the Rappahannock River, the Confederates engaged in another bloody battle near Manassas and held their position as the Union Army retreated to Washington D.C. to defend the capital. ROTC students will learn a great deal by considering the First and Second Battle(s) of Bull Run. Historic Gettysburg National Military Park in Pennsylvania is the site of one of the bloodiest battles of the Civil War. Here, President Lincoln delivered the “Gettysburg Address.” Gettysburg recently celebrated its 150th anniversary in 2013 to mark the battles of July 1863 that brought the Civil War to Northern territory. The National Park Service published several retrospective books on the “contributions of diverse ethnic groups to the Civil War” such as Asians and Pacific Islanders, American Indians and Hispanics. To celebrate the 150th anniversary, there was a re-enactment of the Iron Brigade Charging McPherson’s Ridge –a decisive move for Union troops. The collections, relics of war and stories as well as photos and multimedia presentations and educational tours make the experience come alive for the young ROTC student. ROTC instructors will consider this tour geared towards the future officer a solid learning experience. It will be especially helpful for the study of strategy. Even more notable will be the price of victory – through death, injury and loss of property for many. Students will come away from the Great Battlefields Tour with a greater body of knowledge about the United States early military history than before. Learn more about creating a Great Battlefields Tour of Washington D.C. Email: info@educationaltravelconsultants.com. Capitol Renovation Project: Blended Learning For Class Trips to Washington D.C. The Statue of Freedom stands high atop the Capitol Building in Washington D.C.
Begun in 2013, the Washington D.C. Capitol Renovation project is now winding down. With the final coats of paint being added now is an excellent time to learn about the nation’s Capitol building – and see it anew. The signature dome needs periodic renovation because it is made of iron, and there are places where moisture has rusted the dome and its embellishments. This leakage affects overall structure. Since the status of the exterior threatens the interior of the Capitol, time was of the essence in spearheading this project. The exterior of the capitol building was last renovated in the 1960s. A study revealed over one thousand cracks in need of repair, many on the east end of the building. To expeditiously reverse the aging building’s decay the Architect of the Capitol, Stephen Ayers, stepped in with a plan for a thorough overhaul of this historic building. He adapted a “lock and stitch” technique to patch the aging iron structure and envisioned a thoroughly repaired and sealed Capitol Dome from start to finish. Piece by piece, the Architect of the Capitol and crew have been stirring up lost histories about the U.S. Capitol. The building itself was more like a forum at one time, with a large rotunda and place for representatives to meet formally to debate bills. In the 1860s, Thomas Walter, an architect, won a contest for plans to add two wings to the Capitol: one for senate offices and one for the house of representatives’ offices. His idea for the dome was not included in his contest submission. Instead, his vision of an ancient Roman and European inspired dome was part of a large drawing on his office wall. Being in the unique position of architect, Walter was able to convince government officials to sign onto his vision. The dome was completed in 1863. Students may not be on site at the Capitol, but can learn much about what goes on there by visiting the Architect of the Capitol website (www.aoc.gov) and viewing YouTube footage of this historical project. Here, individual details of the Capitol and its builders are featured. A lengthier piece on the history of the Capitol to present day is available in a clip from Sixty Minutes (https://www.youtube.com/watch?v=nu3DicMrzKY). Viewing this news story will help students put the history of the Capitol into perspective. Students may be all too familiar with the sight of the scaffolding covering the Capitol building on the news. Through class exercises students can be asked to closely examine the history of the U.S. Capitol. Informed by research, students will become familiar with the people and stories behind the Capitol building. 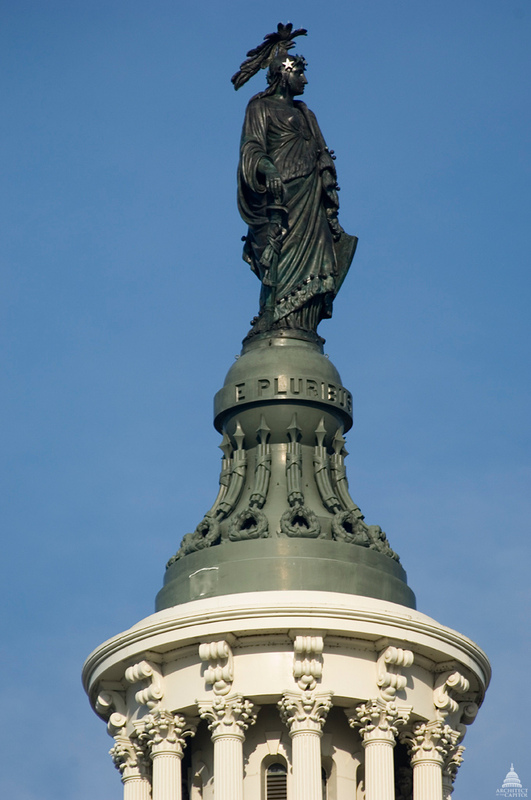 Considering the unique history of the Capitol’s expansion, it should come as no surprise the Statue of Freedom atop its peak is also mired in a remarkable history. Made by Thomas Crawford, an art student in France in 1863, the Bronze statue is a true symbol of the melting pot of humanity – converging in the United States. Crawford cast freedom as a woman who appears to be dressed in Native American garb and also has an eagle’s feathers and open beak draping her crown, with the nine stars of liberty around he forehead. In her left hand, the statue grasps “the laurel wreath of victory and the shield of the United States with 13 stripes.” The charm of her exquisite natural beauty and native garb combined with the symbolism of the eagle and stars and stripes make the crowning sculpture on the U.S. Capitol a symbol of a diverse nation with pride. Students can further explore the history of the artist, Thomas Crawford, and detailed features of the statue of liberty at: http://www.aoc.gov/capitol-hill/other-statues/statue-freedom. Teachers will want to think about capping the in-classroom Web based learning and research by planning a real time class trip to Washington D.C. In D.C., student groups can see the inside of the Capitol Rotunda and tour the interior of the building to learn even more facts. Student groups will be able to observe the representative branch of government in action. To learn more about scheduling a class trip to Washington D.C. Request a Quote.